Read this guide before making or choosing your book cover. What complete rubbish! Getting a book cover right is vital because unless it catches the eye of someone looking for a book, they will never read the description, never read a sample and never make a purchase. If you are an indie author your cover will make a huge difference to your sales. Few books are successful without some sort of cover image. A good cover image should give the reader an idea of the book content. Look at the image used without any title or author text. Does it give you an idea of what to expect? Take a look at the five covers shown above. Do any of them match this book description? With her mom in prison, and her father AWOL, ….. is sent to live with a squeaky-clean family who could have their own sitcom. She launches a full-scale plan to get sent back to the girls’ home when she finds herself in over her head…and heart. Is there any sort of formula for judging a cover image? I would suggest looking at it without the text. Does the image give any idea of the book content? I’m judging them on Amazon’s thumbnail size – what a reader will see first. Silent as the grave – A large, old house, possibly an institution of some kind? Certainly NOT a castle as the book description indicates – Expectation: Ghost? Horror? Fresh doubt – Looks like a derelict factory. No clues here other than a man is standing in it – Expectation: Business venture? Do any of them grab your attention? My analysis is as follows – I’ll explain EMV in a moment. Of course you want to know how to measure the EMV of your title. It’s easy to do on-line at http://www.aminstitute.com/headline/index.htm Enter your headline in the box and select ‘Media & Communications’ as the category. Your title must be at least four words (and less than 20). If your title is shorter than that, add some neutral words such as ‘as’, ‘the’, ‘and’ or ‘if’ until you have four words. Remember – as the ‘Fresh Doubt’ and ‘Where there’s smoke’ books show, it’s possible to have a successful book with a low EMV score but you’ll need an exceptional cover image or a recognised author name for that. If you’re really stuck for cash and you can’t produce your own cover then consider getting a cover from http://fiverr.com. This site will put you in touch with a number of people who will produce a cover for just $5.00. Use caution here though – make sure any images they use are not copyright. 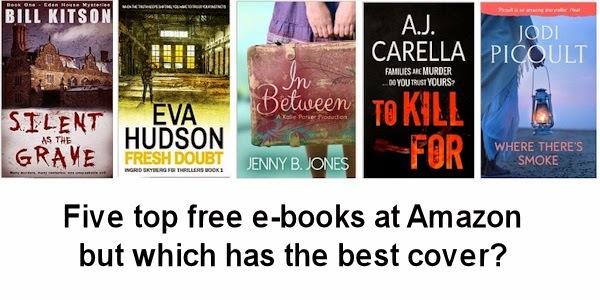 I used the five top free ebooks at Amazon as my examples. I have not read any of them (yet) so I can’t honestly suggest you read/don’t read any of them. If you are interested, I’ve added a link to each which takes you to your local Amazon. There is no guarantee they will always be free though – check before you download.